Beefeaters and the Tower of London? The guards at the Tower of London are called Yeoman Warders. In principle they are responsible for looking after any prisoners at the Tower and safeguarding the British crown jewels, but in practice they act as tour guides and are a tourist attraction in their own right. There are twelve Yeomen Warders. While their role is usually confined to the Tower of London, the Yeomen Warders do take part in one State ceremony. At Coronations, they form a guard of honour inside the annexe at Westminster Abbey. Where does the name Beefeater originate from? The name Beefeaters is often thought to come from the French word - 'buffetier'. (Buffetiers were guards in the palace of French kings. They protected the king's food.) However, the name Beefeater is more likely to have originated from the time when the Yeomen Warders at the Tower were paid part of their salary with chunks of beef. This took place right up until the 1800s. The Queen's Body Guard, known as the Yeomen of the Guard, are a bodyguard of the British Monarch. There are 73 Yeomen of the Guard, all of whom are former officers and sergeants of the British Services. It is the oldest of the Royal bodyguards and the oldest military corps in existence in Britain. The Yeomen of the Guard have a purely ceremonial role. They accompany the Sovereign at the annual Royal Maundy Service, investitures and summer Garden Parties at Buckingham Palace, and so on. Their most famous duty is to 'ceremonially' search the cellars of the Palace of Westminster prior to the State Opening of Parliament, a tradition that dates back to the Gunpowder Plot of 1605, when Guy Fawkes attempted to blow up Parliament. The History of the Yeoman Warders and the Yeoman of the Guards. The Yeomen of the Guard were formed in 1485 by King Henry VII. After his victory at the Battle of Bosworth, he gathered a group of soldiers together to become his personal bodyguard together and they accompanied him wherever he went as his nearest guard. 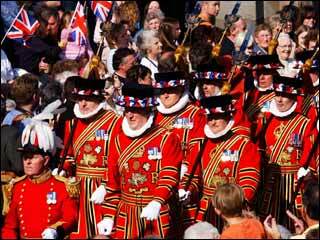 The Yeoman Warders were formed by Henry VIII. In 1509, Henry VIII decided to leave twelve of his old sick and infirm Yeomen behind in the Tower to protect it. He took the remainder of the bodyguard away with him. The twelve he left are origins of the Yeomen Warders who guard the Tower still today. They are different from the Yeomen of the Guard, who accompany the Queen on state occasions and are the Queen's personal bodyguards. Both the Yeomen of the Guard and the Yeomen Warders are best known for their scarlet and gold State dress uniforms which date from 1552 and are worn on state occasions. The uniform consists of a knee-length scarlet tunic, scarlet knee-breeches and stockings, and a round brimmed hat called a Tudor bonnet. Queen Elizabeth I introduced the distinctive white neck ruff. The State dress uniforms of Yeomen of the Guard are almost identical to those of the Yeomen Warders, but the Yeomen of the Guard can be distinguished by their cross belts worn from the left shoulder. The uniforms of the Yeoman of the Guard and Yeoman Warders include the thistle, rose and shamrock, emblems of Scotland, England and Ireland. For everyday duties, Yeomen Warders wear a red and dark blue undress uniform. Yeomen Warders working at the Tower of London, are usually seen wearing the blue undress uniform (pictured left) granted to them by Queen Victoria in 1858. This uniform also bears the initials of the Sovereign.